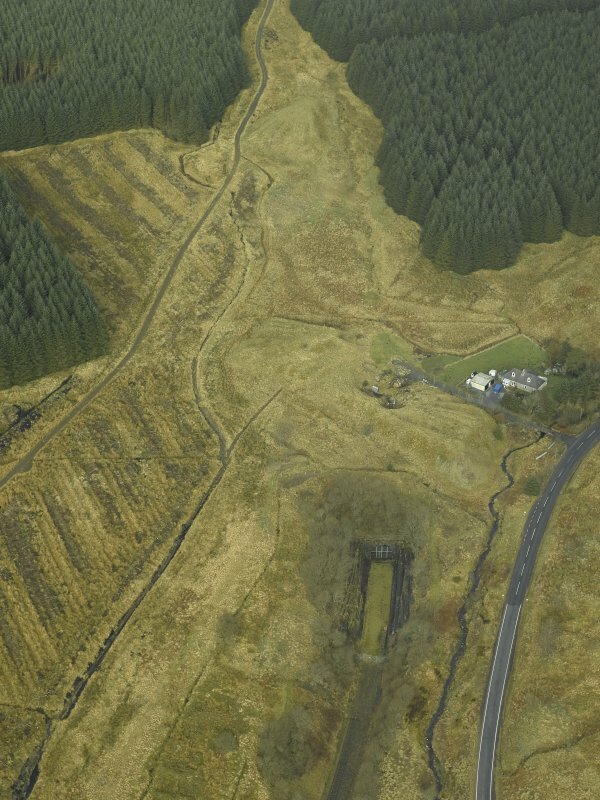 Oblique aerial view centred on S end of Whitrope railway tunnel and Whitrope Cottages, taken from the SW. 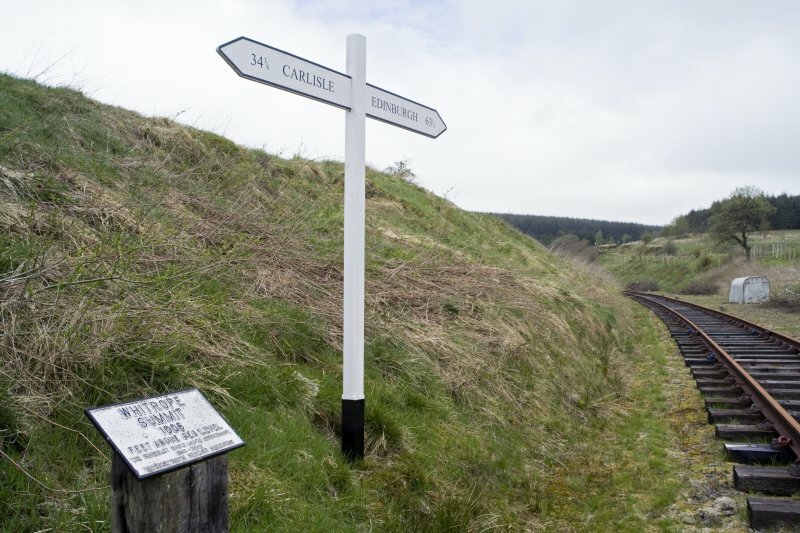 Detail S of Whitrope tunnel S entrance showing modern signpost/milepost connected to the Heritage Centre. 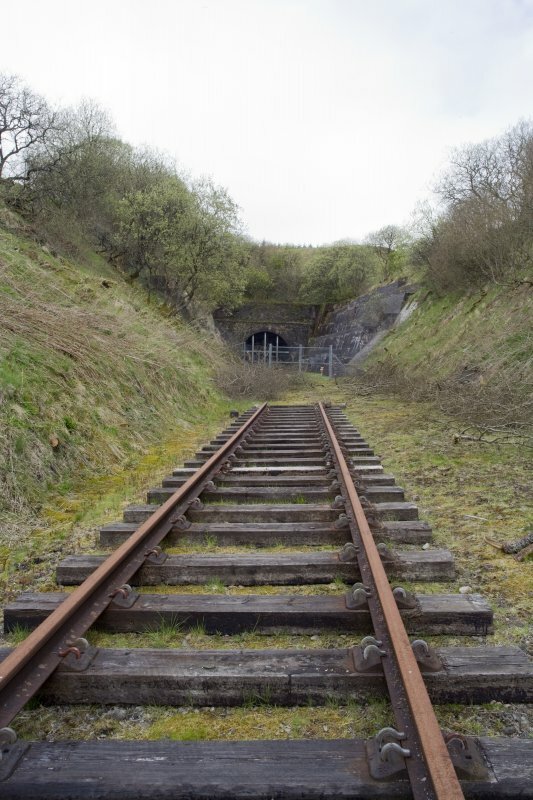 View from S of Whitrope railway tunnel mouth, S entrance. Relaid railway track as part of Heritage Centre. View from S of tunnel mouth. View from SSE showing tunnel mouth and retaining walls at entrance. 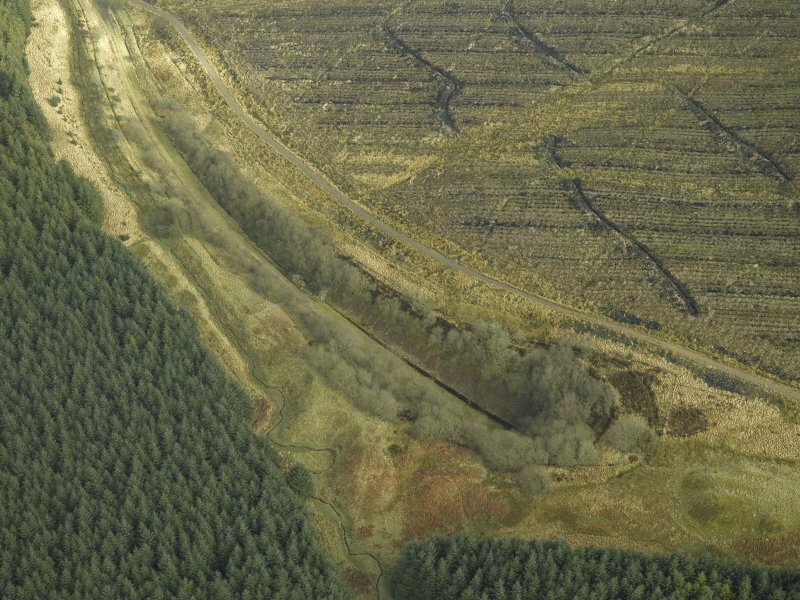 Oblique aerial view centred on N end of Whitrope railway tunnel with spoil heaps, taken from the NW. View from S showing E retaining wall. 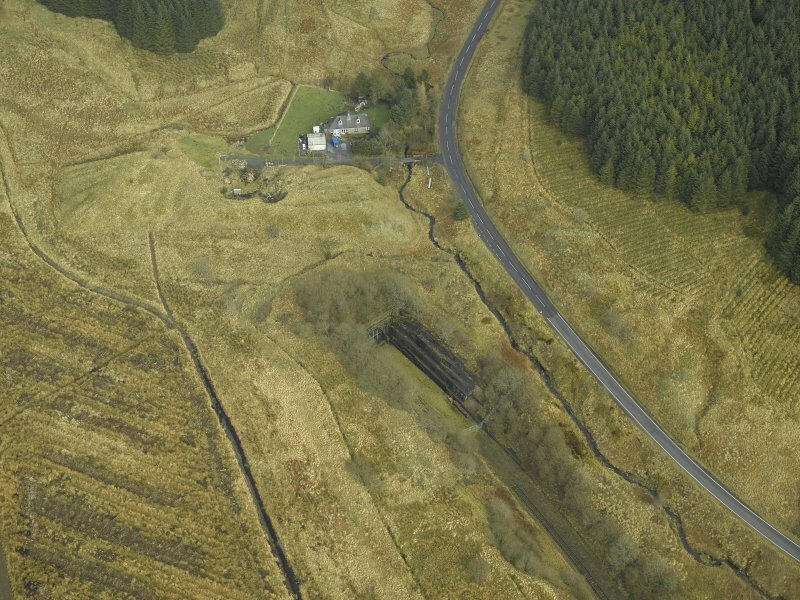 Oblique aerial view centred on N end of tunnel, taken from the SW.
Oblique aerial view centred on S end of tunnel and Whitrope Cottages, taken from the S.
This tunnel formerly carried the Edinburgh-Carlisle major line of the North British Rly (the 'Waverley Route') beneath Sandy Edge. The summit of the line is adjacent to the S entrance to the tunnel. The tunnel crosses the boundary between the parishes of Cavers (to the N) and Castleton (to the S). Information from RCAHMS (RJCM), 7 February 2006. 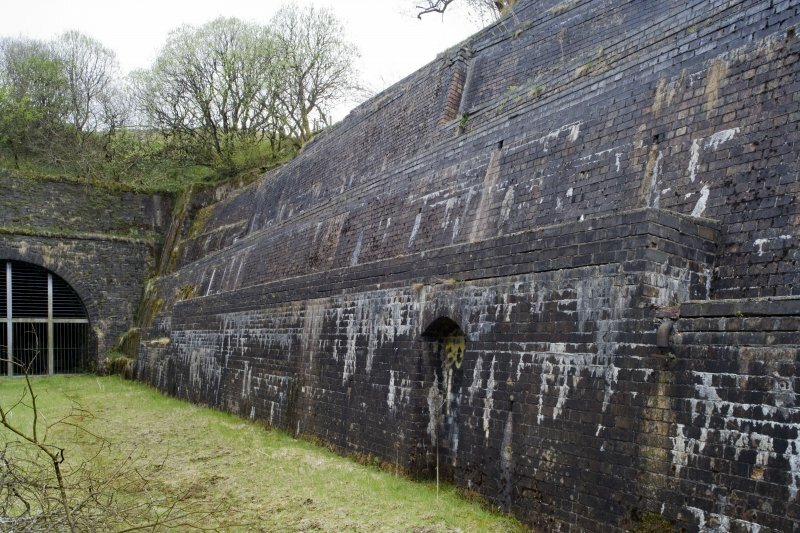 Whitrope tunnel is situated under Sandy Edge. 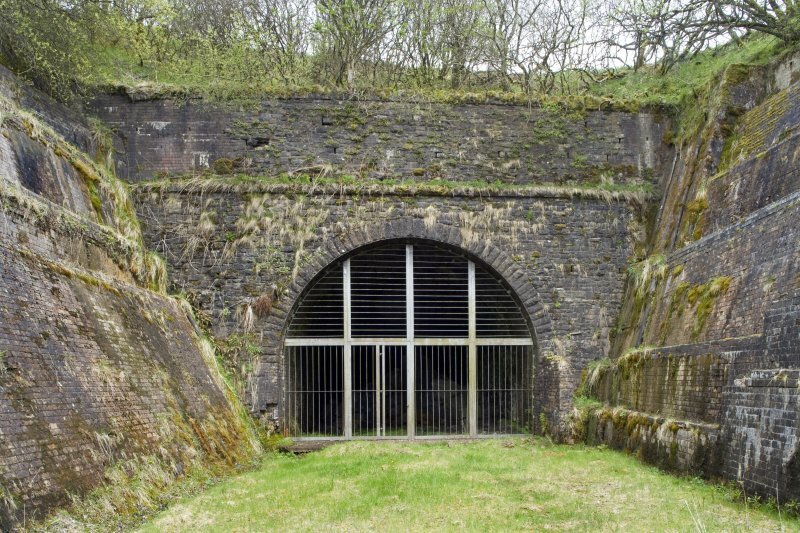 The tunnel is about 1104m long, the N portal in stone is entered through a stone lined cutting (Cavers ph) and the S portal is of random rubble with a stone arch (Castleton ph), the entrance is through a cutting, revetted by steep stone retaining walls. Surface and burn water was drained through drains into a pipe under the trackbed. Five spoil heaps from the excavations survive on the surface, at NT 52604 00770, NT 52537 00948, NT 52437 01170, c. NT 5225 0162 and c.NT 5232 0147. The tunnel is now closed to the public due to the dangerous condition of the S end. Route 1006 ft above sea level near its south end with an approach gradient from the north of 1 in 96. It is located in desolate country three miles south of Shankend Viaduct and accommodated a double track. On 2 July 1862, the day after the line was opened, ‘passengers looked out on a snow covered landscape dotted with the rusting abandoned equipment’, which was auctioned from 5– 7 January 1863. Special trains stopped at the south end of the tunnel and at Shankend viaduct for the sales which took place as soon as the trains arrived. William Ritson. 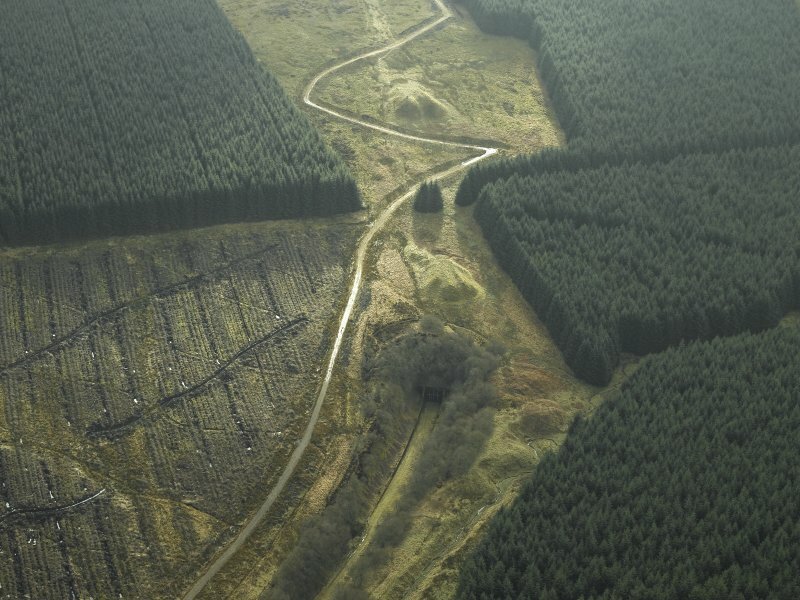 The line closed in 1969 and is now owned by the Forestry Commission. 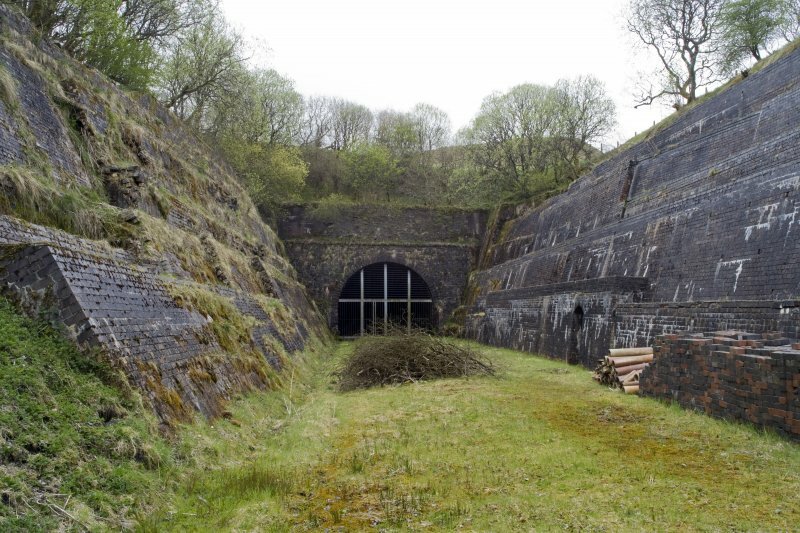 The Waverley Route Heritage Association, formed in 2001, is taking an active interest in reopening the tunnel, now made more difficult by recent roof falls.